Don’t you just love being resourceful? Whoever had the brilliant idea of using the liquid from a can of garbanzo beans as an egg white rather than tossing it down the kitchen drain is nothing short of a culinary genius! Oh, and the name it’s been given – Aquafaba – now how’s that for a fancy-smanzy term. I don’t know about you, but I love it! And I love Aquafaba. I am a believer. 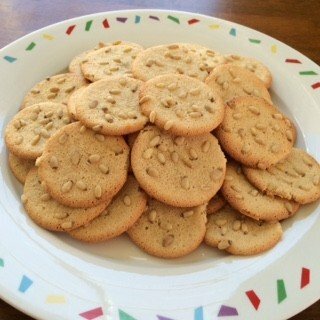 My Grandmother’s Pignoli Cookies…but there was a problem beyond not knowing how the aquafaba would work in place of egg whites. When I put my fingers on her passed-down recipe, I not only needing to tweak it to accommodate the swapping out of the aquafaba for the egg whites (and her recipe also called for honey, but that’s an easy swap), I also did not have any of the other ingredients in my pantry, specifically no almond paste, a key ingredient second only to the egg whites. So, this meant I really needed to virtually write an entirely new recipe. Preheat oven to 350 degrees Fahrenheit. Prepare three cookies sheets by lining them with parchment paper. Pour the chilled aquafaba and the cream of tartar in a large electric mixer with the whisking beater. Turn on high and beat until soft peaks begin to form. It should take approximately 2-3 minutes. Add the confectioner’s sugar, agave, and salt, and beat again, until the soft white peaks glisten. This step should take approximately 2-3 minutes. Add the almond flour and beat until mixture is light and fluffy, with soft peaks remaining. With a large piping tip on a pastry bag, open the lip of the bag wide, folding the top 1/3 over to the outside. Fill the pastry bag with the batter. The batter will be sticky, so to facilitate this step, put the bag inside a tall vase that you can fold the top 1/3 of the bag over the edge to steady the bag. Once filled, fold the top over. Guiding the pastry bag, pipe 1-1/2-inch rounds about 1-1/2 inches apart. Top each cookie with pignoli nuts. Refrigerate pan of cookies for 15-20 minutes before placing in oven. This step is critical as it will help reduce the spreading in the oven. Bake cookies for 13-16 minutes, until just golden brown around the edges. Remove from oven and slide cookies still on the parchment paper onto wire racks to cool. Allow to cool completely, then peel cookies off the parchment paper and place onto a wire rack to continue setting. *Chilling helps the aquafaba to whip up exactly as an egg white. Note: These cookies will soften if left out and not served that day. 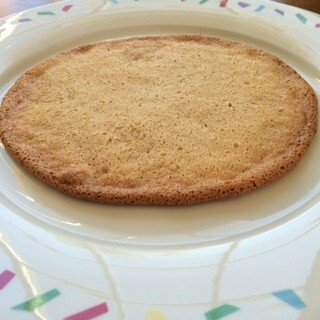 If preparing for another day, you can line the cooled cookies on parchment paper on a cookie sheet and freeze in the freezer. Once frozen, you can stack them in a freezer-safe airtight container until you are ready to use them. Before serving, line them on a cookie sheet lined with parchment paper and re-firm in a pre-heated 350 degree Fahrenheit oven for no more than 2 minutes, then repeating the cooling process as if they were freshly baked. Stack on a lovely cookie platter, and your cookies will be an absolute delight!